Jazz Community Site - Jazz Team Blog » What’s new in DOORS Next Generation 6.0? What’s new in DOORS Next Generation 6.0? This release could well be introducing the most fundamental function into a requirements management (RM) tool since RM systems began. While we continue our drive with usability and productivity, we are also providing support for requirements configuration management (CM), built from the ground up as part of the native tool, rather than simply integrating an external CM system. DOORS Next Generation 6.0 is our first release providing native configuration management of requirements, enabling functionality for strategic reuse and Product Line Engineering. RM offers the ability to define the scope of a project, program, or deliverable—but unless you have control over change this scope could well consume more of your project costs than you expected.Placing requirements under CM allows for the scope to be controlled, while enabling your teams to work in parallel versions at the same time without the need to make project copies to handle variants. On a basic level, CM provides a way to manage groups of artifacts and their versions. Versions can be split to support different variants and merged in order to deliver changes of requirements back to accepted releases. With CM, users can efficiently create different streams to help manage parallel versions without the need to make copies of their requirements. Additionally, there is robust linking that is specific to the stream the user is working in. This means that following the link shows users the requirement, test, or design element on the other end of the link that is appropriate for the stream they are working in. The ability to compare across streams and baselines helps users to understand how their versions or variants are different and to correct any mistakes. The functionality has been designed expecting only a small number of people to engage directly with parallel versions and CM, while the rest of the engineers continue with their work, mostly as if nothing has changed. By default, these new capabilities are turned off and project administrators have to enable them for the server and for each project area where users want to take advantage of them. For some time we have been discussing the benefits of being able to support use cases such as “link a version of a test case with a version of a requirement”. 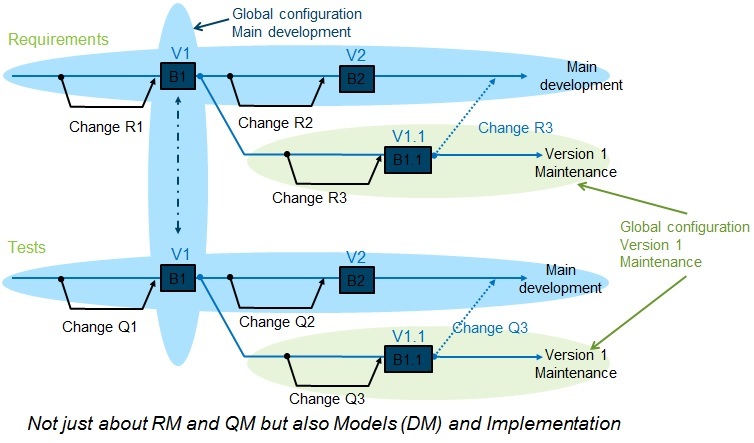 6.0 extends CM with a federated approach to lifecycle information.Strategic reuse for complex systems and software is now possible for requirements (RDNG), design (RDM), test (RQM) and software development (RTC). Plan and manage the reuse of configurations in the many versions or variants of the product or software line. Define complex products and applications as hierarchies of components and reuse those components in multiple products and applications. Automatically handle links between artifacts when branching or delivering changes to another stream such as, links between tests and requirements. Create cross lifecycle baselines to support parallel development of multiple versions and variants, branching and merging, and change management. 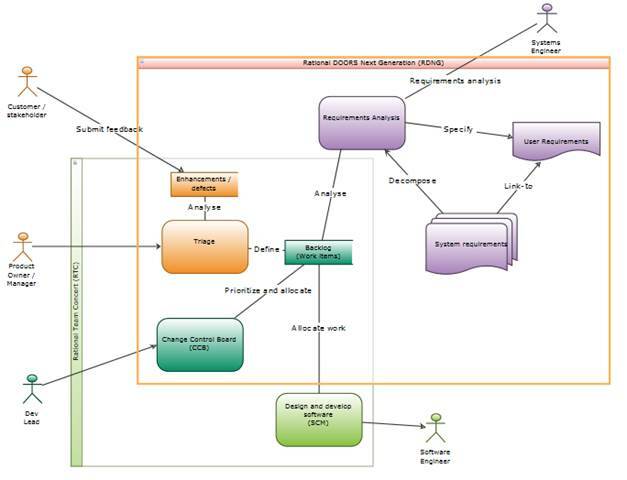 Users can create many types of diagrams to refine and communicate their ideas and to elaborate their requirements. The new diagram editor provides high-quality diagrams that are simple to create in all supported browsers without the need for a Java™ plug-in. The large selection of shapes and themed styles make it easy to create many types of diagrams with eye-catching color palettes. To increase productivity, users can use the keyboard to create all the diagrams. They can comment on and create links between individual diagram elements and other artifacts. Diagrams can be added to modules and embedded in rich-text artifacts. See the Release Notes for further information! This release could well be introducing the most fundamental function into a requirements management tool since RM systems began. While we continue our drive with usability and productivity we are also providing support for requirements configuration management, built from the ground up as part of the native tool, rather than simply integrating to an external CM system. Maybe you can help to clarify something regarding the new “Diagram editor”. I understood that has of this new release, no need anymore to install an add-in in the browser and (I *maybe wrongly* assumed) that it would allow to perform edition of diagram through desktop web browser running on non Windows platform (e.g. mac). Now, I’ve a 6.0 release installed, tried to create then edit a use case diagram in FireFox on Mac. I got a message saying that the platform was not supported (as in release 5). I then tried to edit that same diagram using a browser on Windows, I got a request to install an add-in (as in 5). Did i do something wrong? When you create a new artifact please selected “diagram” as the artifact format. Can’t wait to get my hands on 6.0! How has the upgrade gone for other customers? Trying to figure out how much down time we’re going to need. Tried several times to “try it in the cloud” but every time I’ve gone there, it’s been down for maintenance, hoping to try it soon! Tracey, Without knowing your data it’s difficult to answer. 6.0 has only just been released and so customers are just starting to upgrade. You should consider two aspects to upgrade, first data upgrade and secondly adoption of Configuration Management (CM). I would suggest deploying a test server to start with in order to plan your deployment. As I mention in my blog, CM can provide enormous benefits to the way you manage your requirements but you do need to think about how to define your configuration structure. History demonstrates that getting this wrong in any tool can cause difficulties at a future time. One thing I can say is that for projects not wishing to adopt CM they can chose not to “opt-in” to CM and things should work pretty much as they were before with a couple of exceptions. Please take a look at the literature on Jazz.net for more details. Hi Richard – My team is studying Global Configuration Management. Do the baselines in GCM replace the baselines we’re used to in the RM tool? i.e. Can we still create and access baselines of an RM project area like we used to? Also, if we prefer not to implement at this time, will the reviews still change from formal and informal to current stream and new stream? Yes, you can still create and access RM baselines just like you did before. GC provides additional capabilities which you can choose to ignore or take advantage of as and when you are ready to. I am working with the version 6.0 of Rational DOORS NG. To develop an artifact with format diagram, to enter text in shapes (objects), is not displayed the diagram, but if I delete the text and leave only the ways (objects), the diagram is displayed. This artifact is I am including an artifact of type module. I could indicate how to solve this problem. Thanks.